"Discover How To Overcome Your Addiction And Live Your Best Life "
And Staying Clean In The Long Term! Addiction is one of the most horrible diseases than any of us will face. The fact that you're looking at this page means that you're in the top 10%. Only 10% of us facing addiction actually try and find help. That's because this disease can become so overwhelming and prevent us from seeing the light at the end of the tunnel. Life is a blessing and you know that you want to live it to its fullest. You know that you don't want your addiction controlling your actions any longer. You want to live more, you want to do more, you want to be more. The hardest part of overcoming your demons isn't getting started. The really tough part is preventing those demons coming back into your life a day, a week or a month later. You will face challenges. It will be hard. But it will also be the best decision you ever make.This is your chance to defeat your addiction. This is a crucial step towards your future. 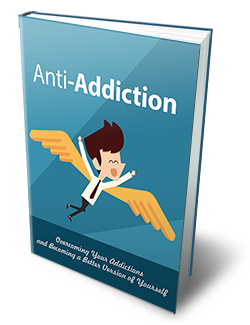 This guide will help you to understand what has caused your addiction and how you can begin to overcome it. You'll create your own plan for defeating your addiction and finish feeling ready to battle yourself. You can own Anti-Addiction today for a mere £1.00. Did I mention this eBook is only £1.00 for a very limited time only? It’s definitely a point worth repeating. You will be hard-pressed to find a more valuable resource and never at a better price. Again, you will receive comprehensive and valuable insights you need to overcome your addiction for only £1.00 !!!! P.S. - This is the ultimate guide to overcoming your addiction.